When Sts. Peter and Paul Parish closed its school in 1975, the Catholic education that took place within its walls did not cease but was reborn with new teachers, students, and a different way to learn about the faith. 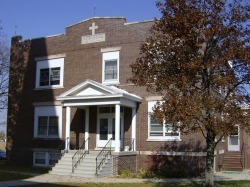 The school, which had served seven generations of parish elementary students, reopened in November 1976 as a diocesan Teens Encounter Christ (TEC) center. Peterstown, located south of Mendota in rural LaSalle County, is often described as "not a place but a state of mind" by the TEC program's participants and supporters, which included the late Father Paul Hettinger. Father Paul was known as the mayor and only resident of Peterstown until his death in April 2003. Visitors will find only the church, the TEC center, a cemetery, and few houses. However, those involved in Peterstown TEC say its not what they see but what they feel that makes the program and community unique. Peterstown is "kind of like a hot fudge sundae -- rich with knowledge, warm and inviting with new people, and lots of hugs . . . (and) sweet with lots of great memories that a special treat should have," said Sarah Motter, a teacher at Holy Cross School in Mendota who has been involved with TEC for more than 15 years. Motter doesn't remember the old Sts. Peter and Paul School but has heard many stories from her parents and other family members who attended there. She told The Catholic Post she believes "what makes Peterstown so cool is that it once was a school and it has some history it to." She feels the building "has the school feeling to it, which creates an environment for learning and change" and allows "teens the opportunity to see the beauty of the earth . . . and to be thankful for the things God has given" without being distracted by loud vehicles, sirens, and other city noises. Following the school's donation to the TEC program, the transformation of the building took place with the help of the late Ben Funfsinn, Bob Aplington, and many teen volunteers. The first spiritual director was Father Placid Hatfield, OSB. He was preceded by Father Philip Davey, OSB. Ginny Funfsinn of Mendota became the first lay director for the teen and young adult program. Further assistance came from Gary and Kathy Parmalee, Joanne Brown-Oberheide and Betty Wenzel. "Back then, people in the area were not familiar with TEC and we had to work very hard to publicize it," said Ginny Funfsinn, a member of Sts. Peter and Paul Parish, which is now served by Father Fredi Gomez and Father Gary Blake. "But we had a fairly good response." That "good response" was still present 20 years later when the community constructed new bathrooms and shower rooms, with most of the labor donated by Sts. Peter and Paul parishioners and TECites. "Many dedicated teens and adults making TEC here willingly continue to work with the parishioners, (by) contributing their time, skills, and funds to maintain and do improvements to the school building and parish center -- named the Father Paul Hettinger Parish Center -- that is home to the Peterstown TEC community," said Gloria Stremlau, a parishioner of Sts. Peter and Paul and former lay director. The first TEC weekend held in the former school hosted 21 girls from around the area. The first boys' TEC retreat attracted 16 boys. Deacon Vince Slomian of Holy Cross Parish in Mendota became the third and present spiritual director for the TEC program in 1980. He told The Post he continues to stay involved with the program because of the teens. "The TEC program has made me realize that our youth of today are very interesting. They want to learn more about Jesus and His teachings," he said. "The teens need people that are close to God to be their mentors," he added. "We have to listen to their needs and their wants. We must continually steer them in the direction of the Father." Dave Pakula of Van Orin served as lay director from 1981 to 1985 when Stremlau and Mark and Deb Wujek of Troy Grove were named co-lay directors. They were later succeeded in 1993 by Janet and Dennis Jones of Mendota and Rose and Gary Rose of LaMoille. In 2007, Brenda Barnickel, of Mendota, became lay director until 2012, then Karen Mecagni of Granville became the tenth director in the history of Peterstown TEC for the 2012-2013 year. Currently, Robin Santman of Peru, is the current lay director. The role of lay director is to oversee the program, take care of the building, help weekend leaders put together teams, buy groceries and supplies, and line up volunteers to serve in the kitchen and in other areas as needed, explained Rose Rose. Rose, a graduate of Sts. Peter and Paul School, told The Post that she thinks it is "really awesome to see and know that the building is being utilized to help people have a faith journey." "I feel really blessed to be involved in a program like TEC and see the growth that comes from it," Rose said, adding she finds it "humbling" to see the seed of faith planted in the teens and adults who go through the program. Drawing participants from a 40- to 45-mile radius of rural communities and a variety of schools is unique for a TEC center, according to Pakula, known as "Pak" to those involved in the Peterstown program. He believes that the closeness found in the rural country atmosphere is also what makes the community so special. "Our uniqueness lies in the fact that we bring in so many people from so many places and we give them a chance to get to know one another through Christ," Pakula said. "We have just two sleeping rooms," he said, adding "when you're sleeping in a room with 15 to 25 other people, you get to know them quite well." A 2001 graduate of St. Bede Academy, Derek Wall practically grew up with TEC as his parents and older siblings were all involved in the program. "My family was pretty involved and I didn't have a reason why I shouldn't" make a weekend, said Wall, who participated in his first TEC weekend as a junior in high school. Rose believes many teens have a need to participate in activities that help their spiritual life grow. "They need a balance between their extracurricular activities and continued faith journey," she told The Post. "They are so busy with work, school, and sporting activities." Stremlau applauds the program for being an "excellent evangelization" tool for both teens and adults. TEC enhances the Peoria diocese because it is "open to teens and active adult Christians of all faiths, which accounts for the growth and success that TEC continues to have in the number of religious vocations and converts coming from the TEC family," Stremlau said. This article, by Kim Souba, was written and publiched for The Catholic Post February 24, 2002, and is reprinted here with permision from The Post.